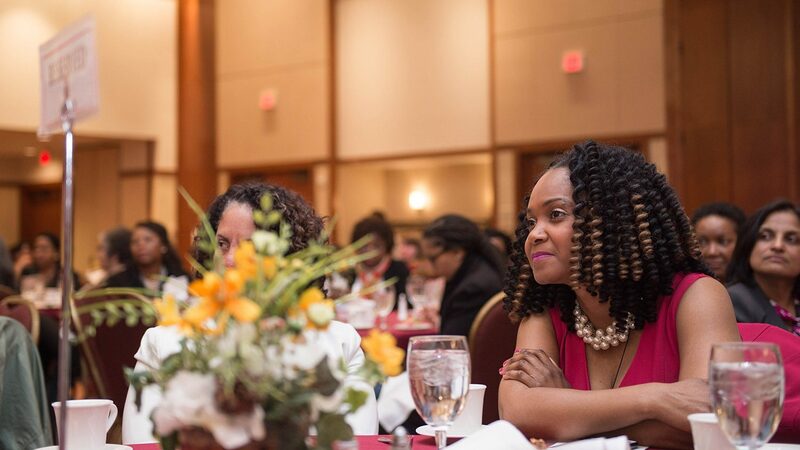 Joy Gaston Gayles, an associate professor of higher education at the NC State College of Education, has received the 2018 Zenobia Lawrence Hikes Woman of Color in the Academy Award. Named in the memory of Zenobia Lawrence Hikes, who was vice president of student affairs at Virginia Tech from 2005 until her death in 2008, the award recognizes a woman of color with a distinguished career in higher education as demonstrated by her scholarly endeavors or administrative and professional accomplishments, her engagement with her campus and community, and her history of advancing the development of young women of color in their pursuit of excellence. “[Gaston Gayles] epitomizes what it means to have a distinguished career in higher education. 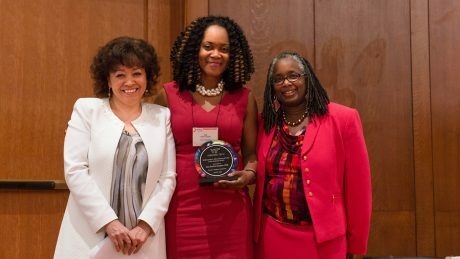 Her scholarly endeavors are outstanding,” said Virginia Tech Alumni Distinguished Professor Lucinda Roy before presenting Gaston Gayles with the award during the 6th Annual Faculty Women of Color in the Academy Conference held April 5 at the Inn at Virginia Tech. Gaston Gayles joined the NC State College of Education faculty in 2007. Her research focuses on the college student experience and how those experiences impact desired outcomes of undergraduate education, particularly for student-athletes as well as women and underrepresented minorities in STEM fields. Her research has been published in the Journal of Higher Education, Research in Higher Education, and Journal of College Student Development, among others. She has also been quoted in numerous national news publications, including most recently in The Washington Post about her research on intercollegiate athletics. In 2017, she co-authored a study on the experiences of Black faculty at predominantly white institutions. In addition, Gaston Gayles has chaired or served on the dissertation committees of eight women of color. For the past three years, she also has served as a faculty coach for the National Center for Faculty Development and Diversity through which she has coached 64 faculty through a 12-week mentoring program. The College Student Educators International Association selected her as Diamond Honoree for her research and scholarship. The Ohio State University recognized her with a 2017 Distinguished Alumni Award. Gaston Gayles earned her doctorate in educational administration and higher education from Ohio State, her master’s in higher education administration from Auburn University, and her bachelor’s in adapted physical education and kinesiotherapy from Shaw University. She previously was an assistant professor at Florida State University.